Books coming soon! For publication updates, please bookmark the Publication Updates page. If you are receiving this post in your email, it is because you have subscribed to the CGB Book Blog. This is where all new pattern releases and videos will post, so stick around! This has been a very visual couple of weeks at CGB HQ. I’ve been finishing a job that only I can do, which is to complete the library of images of all of the pieces I’ve photographed for CGB and get the color separations in order for the press. I have nine external hard drives with backups and over 10,000 images and videos. There have been four MacBooks and eight digital cameras used since the start of the project. Making sure we have all of the final cuts in one neat place is a monumentous * and beautiful task. In this post are a couple of photos you haven’t seen yet from the new books. Below is a shot of one of our new Messenger Cycles. The idea is to take advantage of the special spaces inside the tetrahedra to place messages, prayers, photographs or memorabilia inside the spaces before closing them up. Each of the three spaces behind the red-tipped triangles has a rolled-up, handwritten prayer for peace behind it. As the cycle turns (like temple origami or Tibetan prayer wheels or prayer flags in the wind) the intentions of the maker will move outward through the hands of the persons turning, and will flow to all peoples, to the Universe. It’s a nice idea, and who doesn’t want to send our good thoughts, hopes, dreams and prayers wider and higher, further upward and outward? Our dreams are what make us human, and striving for them is what can allow us to have a real impact. This pretty blue Morpho cycle is one of our 18-Triangle Butterfly Assemblies, and we made it specially for the UK Beadworkers Guild in honour of Susannah Thomson’s contributions to our project. It will be in their January issue, and when their issue comes out, we’ll definitely post the pattern for free here on our web site. Susannah herself will be here with us in January at MIT, as will a few other surprise guests like Victoria Vesna, Ana MacArthur and Nico Williams. I’ll feature them individually in the next few weeks here on the blog. The next photo is one of my favorites. 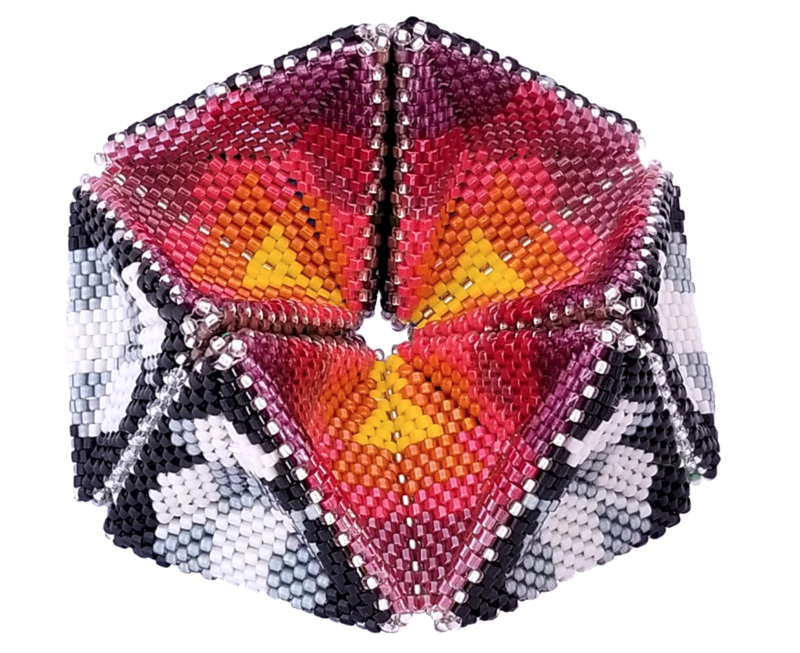 It was assembled in Photoshop, and it calls out the essential geometry of our beadwork with colour. In this shot, you can see clearly the specific coat-hanger shape of the geometry that comes from placing herringbone increases in every round of peyote stitch. 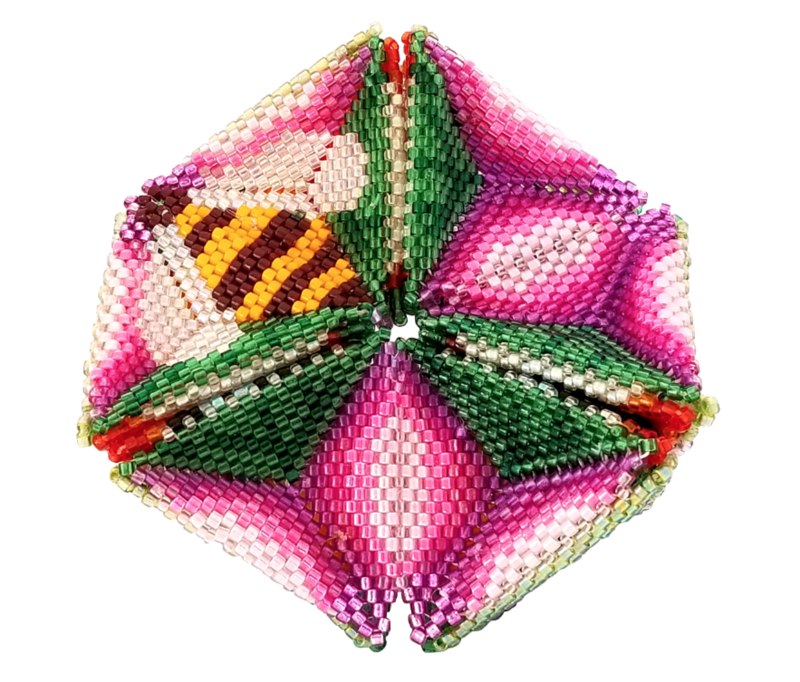 The two stitches create triangular cells of fill, and no matter what size the pieces are (or how many increases you place in the center) the geometry of the triangle-cells in between the increase lines is the same. The only reason that they look slightly different in the photo is because the Square is Warped, and the Triangle is lying flat on the table. 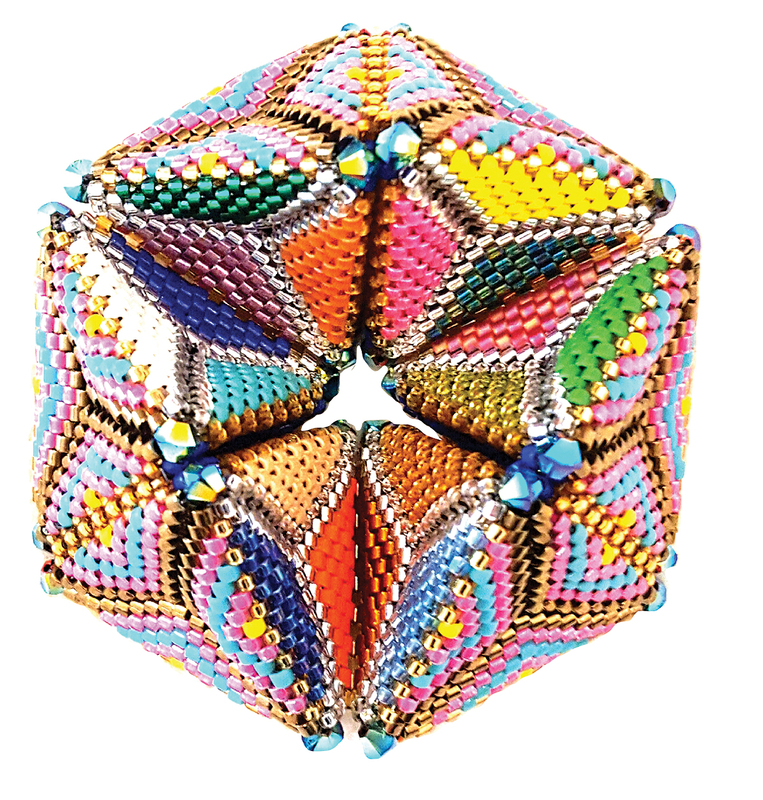 Below are two Kaleidocycles from the May 2018 BeadALong at the Facebook group Seed Beads & More. Each one has a story, and each one was made with love, difficulty, kindness, and a care for trying to express an idea as elegantly and correctly as possible. CGB will be collecting lots of the photos of cycles made in this exploration – what won’t fit in the books will go on the posters and be shown in the online galleries. The images I’m finalizing now are for the first of our new books to go to press, the CGB Pattern Book. We are still collecting some Cycle images for CGB Volume III, so if you are in one of the other large groups that made Kaleidocycles, BatCycles, and Power Puffs (yes, they turn out to be Machines as well) then don’t worry, we want to include you all. The CGB Shop will re-open in a matter of days, and we’ll start taking new and wholesale book and poster orders at that time. The first two books are being reprinted with a new enclosure showing the new techniques, and will be back in stock in January. Things are moving pretty fast now, despite it being the holidays. Don’t worry if you’ve moved since you ordered. It’s actually pretty easy to keep up with US address changes these days with the new postal software. There will only be a few of you (mostly out of US) we need to email to discuss delivery. * Monumentus is a little-used word that describes how big, wide, tall and important a thing (in our case the gorgeous tangle of questions) can turn out to be. A truly monumental pile of questions, answers, photos and actual beadwork is condensing into a thrillingly momentous** moment. As it turned out, though, somewhere around 2006 other people began using it. ** Momentous is a word that was dreamed up in the 1650s. It was a time when people must have needed a nice word for not just moments, but special moments. That there are, sometimes events or discoveries with so much momentum that they can change the future. 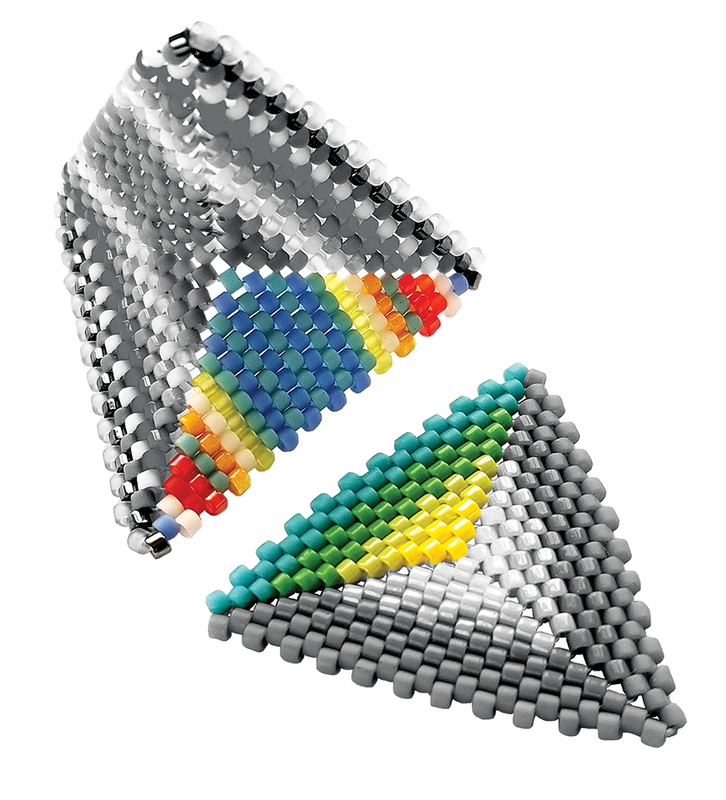 *** The ONLY way to get a peyote Triangle to lie flat on the table is to make it with almost no tension, just enough to create a smooth fabric. If you use even modest tension, even our simple Triangles are hyperbolic. And hyperbolic = BATTERY. Good evening Kate … I’m afraid I missed something. Is the digital book ready now? Thank you, I can not wait to receive my book. Have been watching for so long … any when it will be ready for purchase please? Soon! We can only manage so many pre-orders, so when the book is finished and ready to ship, we will take new orders. Hugs! I am eagerly awaiting the new book! I have the first two from Amazon, but not the pdf access. Can’t wait to see the new one! I hold your first CGB book and preordered the third book. Unfortunately l forgot my password and cannot download the pdf. Please let me khow how to restore my password. These are just beautiful! Cant wait for more in your book! Thanks!!!! Thank you for the update Kate. Looking forward to the book. 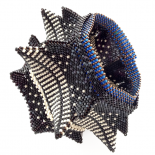 Will it contain patterns of the kaleidocycle by Claudia Furthner? Love Love these photos. Are all of these in your new book? Yes, these are from the Pattern Book, which is the first on the press. Yay!!! The amount of data collected blows my mind!! The messenger cycle sounds so awesome! I love the physical and visual meaning of it! I love the idea that our photos being used in this project, how exciting! I just cant wait! A huge THANK YOU to the entire CGB team who put so much effort into this book, shared all their knowledge and accomplishments and for opening the door for all of us to a broader way of beadwork! A special thanks to Kate McKinnon for the book!!! I really enjoy learning a new way of beading!!!!! Kate, thank you so much for your and the CGB team dedication. The books are so tantalizingly close to being in our hands! I can almost feel them being nestled in my hands. This entry was posted on December 2, 2018 by katemckinnon.